Viewing time: 5 mins. 32 secs. The Write Question is a weekly video podcast all about writing. 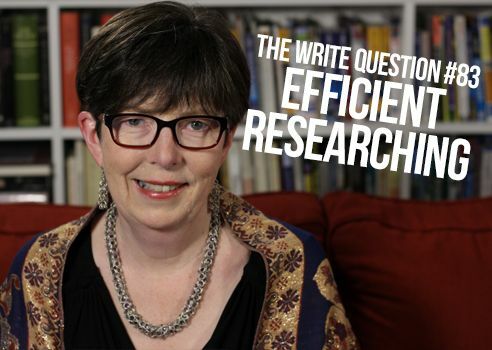 Today’s question is about how to do efficient research. If you have a question you’d like me to answer you can email me at daphne@publicationcoach.com, tweet me @pubcoach, or leave a message for me at the Skype account, The Write Question. Welcome to The Write Question, I’m Daphne Gray-Grant and my topic today is about how NOT to get bogged down by research. I have a question from Ann Gomez the founding president of Clear Concept Inc, a productivity firm based in Richmond Hill, Ontario. Here’s what’s she’s asked. Thanks for your question, Ann. The type of writer who usually asks me this type of question is a grad student who’s desperate to finish their thesis or dissertation. In your case, however, I know your writing is strongly evidence-based so you likely face some of the same concerns as many grad students. First, make sure you never do your research at the same time you do your writing. They are two entirely separate jobs and if you try to mush them together you won’t accomplish either job terribly effectively. Do your research first, before you do any writing. But before you do even that, I’m going to suggest you do a mindmap to try to reign in your research needs. As a time management expert, you’re undoubtedly familiar with Parkinson’s Law – the idea that work expands to fill available time. Research is a bit like Parkinson’s Law on steroids. That’s because writers are often interested in what they want to write about. This means that they will want to follow every loose end that beckons them. Don’t allow this to happen to you! Instead, clearly define your objective before you start researching. Mindmapping is a great way to achieve this goal and I include a number of links to videos on mindmapping, below. I know it might feel scary to take a big subject — say Global Warming — and decide your argument is going to be: “I support a cap and trade approach to reducing emissions.” (Or, for that matter, “I don’t support a cap and trade approach.”) But if you focus on one highly specific point, you’ll reduce your research needs, dramatically. Of course, this approach does presume some prior knowledge so you might want to read ONE source that can give you an overview of the issue before you make your decision. But keep this kind of reading to a bare minimum. And, guess what? If you discover later that you’ve made a mistake and you should be arguing — and therefore researching — a different point, well you can do that then. What you want to achieve is a kind of a research brief that is so deeply specific you’ll be able to say to yourself “no, I don’t need to read that now,” to anything that falls outside of the point you’re trying to make. Note that I used the word “now.” Of course, you can read additional material later, on your own time, purely because it interests you. I recall working with a doctoral student several years ago who told me she had 48 peer-reviewed papers she still wanted to read before finishing her dissertation. After some discussion, we agreed that she would read just the abstracts and then, on the basis of what the abstracts told her, limit herself to only 10 of the papers. Yes, that 10 was an entirely arbitrary number and she found it hard to accept — until I suggested that she make an additional note to herself about any paper she might want to read — later — out of personal interest. As soon as she had that concept down, she was very happy. Oh, and she now has her PhD. Academics might want to look into other software that will not only organize their research but that will also provide citations. What I’m talking about is richer and deeper than either EndNote or Mendeley. The software Citavi is a great solution, but it’s currently available for PCs only, although they hope to release a Mac version later in 2019. Link to Citvai, below. Again, I’m not an affiliate. To summarize, you want to manage the research process and not have it manage you. Clearly defining your objectives at the beginning and having a good system for capturing the research will help you do that. Thanks for the question, Ann! I think the unstated postscript to Collins’ quote is that we all need to live through those times when everything appears to be going wrong. But if you take the steps I’ve outlined, you’re not going to get bogged down and your end result is likely to be both satisfying and useful. Are you making any of these mindmapping mistakes (video)? How can I solve a mindmapping block (video)? How can I mindmap my book? (video)?